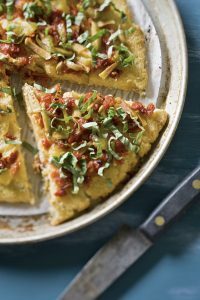 In this healthy, gluten-free cauliflower “pizza” recipe, shredded cauliflower is mixed with mozzarella and oregano to make a flourless crust that echoes the flavor of a traditional pizza pie. The Meyer lemon, olive and sun-dried tomato topping adds a sophisticated Mediterranean flavor, but feel free to try more traditional pizza toppings, such as marinara sauce and mushrooms—even pepperoni. Place cauliflower in a food processor and pulse until reduced to rice-size crumbles. Transfer to a large nonstick skillet and add 1 tablespoon oil and salt. Heat over medium-high, stirring frequently, until the cauliflower begins to soften slightly (but don’t let it brown), 8 to 10 minutes. Transfer to a large bowl to cool for at least 10 minutes. Meanwhile, with a sharp knife, remove the skin and white pith from the lemon(s) and discard. Working over a small bowl, cut the segments from the membranes, letting the segments drop into the bowl (remove seeds). Drain the juice from the segments (save for another use). Add tomatoes and olives to the lemon segments; toss to combine. Add egg, cheese and oregano to the cooled cauliflower; stir to combine. Spread the mixture onto the prepared baking sheet, shaping into an even 10-inch round. Drizzle the remaining 1 teaspoon oil over the top. Bake the pizza until the top begins to brown, 10 to 14 minutes. Scatter the lemon-olive mixture over the top, season with pepper, and continue to bake until nicely browned all over, 8 to 14 minutes more. Scatter basil over the top. Cut into wedges and serve.